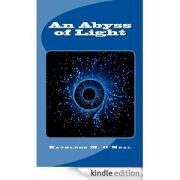 Kathleen O’Neal is probably better known these days as Kathleen O’Neal Gear; particularly in combination with her husband Michael, she is a prolific author, with at least 34 novels published since her debut novel, Abyss of Light, appeared in 1990. I am personally unfamiliar with the main body of her work but it appears for the most part to be an exploration of prehistorical North America, drawing on her training as an archaeologist. Have not read those books, don’t have an opinion on them.